Dame Juliana Berners wrote, in the Boke of St Albans, of the allocation of species of hawk and falcon to their corresponding human ranks in mediaeval society: And yit ther be moo kyndis of hawkes/Ther is a Goshawke and that hauke is for the yeman/Ther is the Tercell and that is for the powere man/Ther is a Spare hawke and he is a hawke for a prest/Ther is a Muskyte and he is for an holiwater clerke. Somewhat tongue in cheek, I believe. According to Richard Almond in his excellent book Medieval Hunting (History Press), the goshawk, lacking the nobility of the peregrine and gyrfalcon to the mediaeval mind, was consigned to lesser men. It was unlikely that the “yemen” would be a landowner of intermediate social status but rather a man em-ployed within an aristocratic family who had time to hawk as part of his work conditions. “Powere?” I think not, for although one third smaller than females, male goshawks, especially those of the larger, Scandinavian sub species, hunt every bit as well and bring just as much quarry to the table as their more easterly female counterparts. All I can say is “thank you”, as I am more than happy to be blessed with the social rank of yeoman. Having flown and hunted goshawks of both sexes, I can attest to the fact that they are, without doubt, the best suited to our fair shores of all the northern hemisphere hawks, being perfectly adapted to hunt most of our native game species. Irrespective of mediaeval attitudes to both the goshawk and its attendant austringer (one who cared for, trained and hunted a goshawk), almost every mews had at least one or two. Why? Well, despite the beauty of the pere-grine and the gyrfalcon and their noble style of flight, the goshawk meant food on the table. Not without reason was it known as the “cook’s hawk”. Many a noble falcon must have dined upon the finer parts of the various game species brought home from field to mews, courtesy of the humble goshawk. cormorants, crows, rooks, swans, bustards, cranes, geese large and small, partridge, pheasant, curlew… and if they want rabbit to eat, let them seek them, well away from their holes.” Obviously, this particular list of quarry types, though legal at that time, held little interest for the lofty falconer. Falconers may have held a lowly opinion of their hawk-keeping brethren, but they obviously realised the worth of employing such a man and his hawk. Falconry is a most natural sport; either something is caught and put into the gamebag or it escapes for another day’s chase. 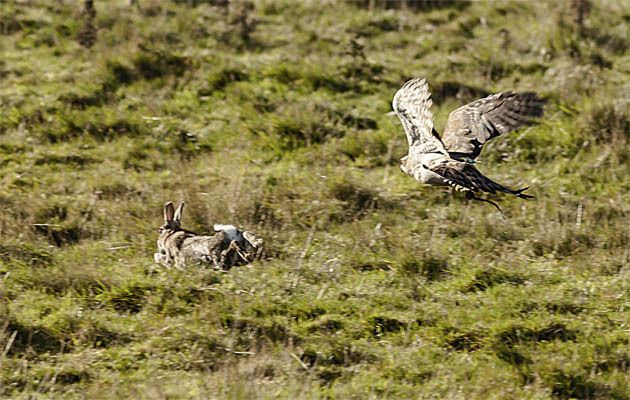 For more than 20 years I have specialised in flying my hawks on the uplands of northern England for the area’s most abundant game species, the rabbit. What a sporting adversary this wonderful creature is – never predictable despite the respective and combined experience of austringer, dog and hawk. I can confirm that, preyed on by a host of natural predators, rabbits have developed a multitude of perfect escape methods. One day’s rabbit-hawking is never the same as the next. The sport is a three-way partnership of man, hawk and pointing dog, our breed of choice being the Hungarian wirehaired vizsla. One of the joys of this sport is that rabbits can be found well away from the sanctuary of their home warren and sit before a pointing dog every bit as tight as a gamebird. The hawk and the dog soon build an amazing partnership, each one understanding the other’s role. Through repeated exposure the hawk learns to recognise what a stationary pointing dog represents. What follows will be the flush, after which rabbits bolt and the hunt can get going. Our dogs are shot over as often as they are worked with the goshawk and our shooting and hawking are identical in style. Think of flying the hawk as feathered rough-shooting. For the dogs, there is one noticeable difference: no final retrieve. A dog is never tempted to pick-up any game the hawk has flown, caught and subdued. One or two over-exuberant pups have received a scuff on the nose from an irate hawk, but that has always occurred within the confines of our garden. Just like the mediaeval austringer, I hawk to eat and one glorious aspect to a hawk-caught rabbit is that there is no spoilt meat: no bruising, no fractured bones. All is used, shared equally among the hawk, the dogs and us. A good hawk soon learns to immobilise prey by careful placement of its feet, after which it is its attendant austringer’s duty, especially in the case of rabbits, to get to it in quick time and apply the necessary coup de grâce. The goshawk has two wonderful tools for hunting. Firstly, its eyesight. Many is the occasion when a hawk spots a moving object well before the dog scents it. The hawk, held securely upon the fist, will bate (try to fly towards what it sees) and alert the austringer to the likelihood of potential quarry somewhere ahead. Directing the dog to where the hawk has indicated usually results in the dog pointing, and a flight follows. Besides having incredible eyesight the hawk has powerful feet with long, scimitar-like talons. Careful husbandry will keep them sharp throughout a season. They need to be sharp as a good-sized buck rabbit running at speed takes some holding. Many refuse to accept defeat and a fair old fight ensues. Experience teaches a hawk that, in order to stop a fully grown rabbit, it must place both feet squarely on the rabbit’s head and hold on. The force of pressure applied from a hawk’s powerful feet has to be felt to be believed. I have taken a number of the larger rabbits caught home with me, unpaunched, just to get an idea of their weight and many have tipped the scales at almost 6lb. However, the size of a rabbit is no indicator of the fight within it. I have had hawks catch huge buck rabbits that gave the up ghost the moment the hawk took hold and seen smaller individuals fight and kick themselves free. Whatever their size, anything you can do with chicken, you can do with rabbit, a meat that deserves a higher ranking on the culinary scale. So if, when travelling through the northern uplands, you come across an ill-formed man with large feet carrying a hawk and ac-companied by a ginger dog, it may well be this particular austringer hunting his supper.